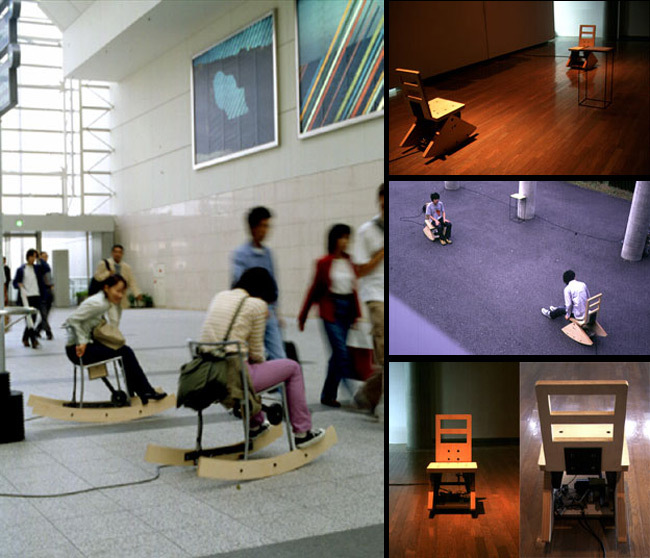 Remote Furniture (1999), by Noriyuki Fujimura, is an interactive public art installation involving computer controlled chairs. In this piece, two rocking chairs are installed on the floor facing each other. The audience sees no interactions between chairs until two people from the audience sit in the chairs and rock back and forth. Each chair has a sensor and motor which enable mutual interactions between the chairs, causing the rocking motion of one participant to be transferred to the chair of the other and vica vera. The aim of Remote Furniture was to create direct and tactile touch.